A.R. Menzies & Sons, Ltd.
Allan purchased the family business from his father in 1989. His grandfather started A.R. Menzies & Sons Ltd. in 1920 after suffering a lumbering accident in which his leg was amputated. This provided the catalyst for him to learn the art of prosthetics and start his private practice. This makes the company a third generation family-run business. To learn more about the highlights of the last nine decades, see our Company History page. 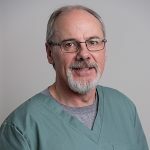 Allan has been a Canadian Certified Prosthetist since 1979. He attended the Rehabilitation Institute at Northwestern University in Chicago and numerous in-depth courses around North America. Allan continues to attend compulsory seminars to continually upgrade his skills and knowledge on advancements of prosthetic components, products and manufacturing. 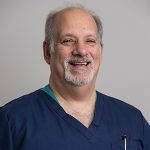 He has been helping those who have lost a limb rebuild their lives and independence with a combination of cutting edge technology, skilled workmanship and compassionate care for forty plus years. Patients come to A. R. Menzies from as far away as Cape Breton, mainland N.S., P.E.I. and Maine. It was only last summer that Allan saw a patient, who now lives in Saskatchewan and returns to his summer home each year, that reminded us that he has been coming to Menzies since 1929. He was just three years old! Allan was recognized by fellow Rotarians and received the Paul Harris Fellow award in 2009. This is in recognition of a person’s exceptional service to the club and community. This is one of the highest distinctions that a Rotary Club may bestow to a Rotarian. Barry has been a practicing Orthotist at the Menzies’ clinic for 15 years. He has been practicing in the field of orthotics for more than 30 years. He moved from New York looking for a more “relaxed” life. Barry received his education at New York University, where he obtained a Bachelor of Science in Prosthetics and Orthotics. In 2007, Barry wrote his Canadian Orthotics exam and became Canadian Certified. Barry works very closely with health care providers at the Stan Cassidy Rehabilitation Facility. The Stan Cassidy Centre For Rehabilitation is a recognized North American leader in neurological rehabilitation. Steve is a 37 year veteran of the pedorthics department. 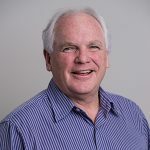 Steve has extensive experience helping people who are suffering needlessly from all types of foot pain such as arthritis, diabetes, sports injury, plantar fasciitis, etc. Foot pain is not normal and often alleviating the pain can be accomplished through designing custom foot orthotics, giving advice on footwear selection or modifying footwear. He received his designation as an American Certified Pedorthist in 1988 and Canadian Certified Pedorthist in 2008. Steve is proud that, for 4 consecutive years, the Daily Gleaner Reader’s Choice award in the foot orthotics category has been won by A.R. Menzies! When not working, you will often find Steve and his wife, Debbie, at their cottage at Davidson Lake. David always knew he enjoyed helping others, so, in 2007 David started his career in Pedorthics at A.R. Menzies & Sons Ltd. as a Pedorthic Technician. In the fall of 2009, he received his certificate as a certified Pedorthic Technician through the Pedorthic Association of Canada (PAC). In the summer of 2018, David passed the “Pedorthist Certificate Program” at Kennesaw State Universtiy, Georgia, USA. In the fall of 2018, passing the American Board of Certification in Orthotics, Prosthetics and Pedorthics exam, along with the PFA Canada exam, he obtained a C.Ped. designation as a Licensed Canadian Pedorthist. 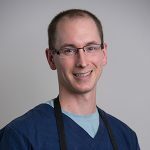 With over a decade of combined technical and clinical experience, David is able to provide patients great support with their foot health needs. Lisa has been employed with A.R. Menzies since 1985. Lisa multitasks between meeting with her mastectomy patients, answering questions reqarding ostomy supplies, and measuring for compression garments. Lisa is dedicated to helping women make a positive difference in the way they feel. Lisa has been helping women after breast surgery live life to the fullest with the world’s leading line of breast forms, partial breast shapers, mastectomy bras, undergarments and swimsuits. 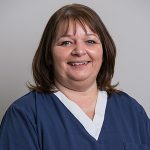 Lisa is also a certified compression garments fitter and trained to measure you for the recommended compression garment prescribed by your Doctor. A.R. Menzies has access to a full line of Ostomy and Urinary supplies. Lisa has more than 30 years of experience, is very knowledgeable and able to answer many frequently asked questions. Lisa is active with the local chapter of the United Ostomy Association. Heather is the daughter of the owner, Allan Menzies. Heather grew up in the family homestead adjacent to the company clinic. She has been exposed to the world of prosthetics, pedorthics and orthotics all her life. 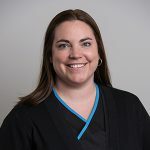 Heather is proficient in all dispensary fields of the clinic and able to provide excellent support to the team. 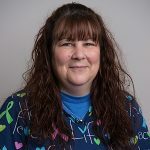 Heather has been fortunate to work in many administrative roles over the last 14 years; including accounts payable, receivable and payroll clerk. Today, she works very closely with her dad and is instrumental in the daily running of the business. Sandra is a long term employee with more than 20 years of experience. When you register at the clinic you are often greeted by Sandra. She is proficient in all dispensary fields of the clinic and able to provide excellent customer service. Sandra graduated from Université de Moncton with a BBA in 1987. Sandra is bilingual and knowledgeable with all funding procedures. Bridget, is a native of Fredericton. She attended Humber College of Applied Arts & Technology, in the Hotel and Business Management Program. Following college, Bridget was employed at the Hilton Saint John & Trade Convention Centre. 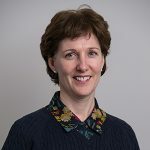 Bridget was employed with the Sheraton Hotel Fredericton, Delta Fredericton and Holiday Inn Fredericton from 1992 – 2005; last several years in the position of Director of Sales & Marketing. Highlights of her hotel career included the organization of several international conferences, the lead organizer for the Royal visit of Queen Elizabeth and Prince Philip and working with Wallace and Margaret McCain for their daughter, Eleanor’s, wedding reception. Bridget has held board positions over the years with several organizations including Homeless Emergency Shelter, Fredericton Chamber of Commerce and Transition House. Bridget has enjoyed the last decade working with her husband, Allan, and his daughter, Heather, at the family business. With her sales, marketing and managerial skills, Bridget was able to inject some fresh ideas and views in advancing the clinic.